The change of season brings a change of starting times at some parkruns. From 1st October some parkruns in Mpumalanga, Northern Cape, Free State and the Karoo will be changing their starting times to avoid the worst of the summer heat. If in doubt about any starting time, please check your parkrun’s website. Upington and Kimberley parkruns have 7am starts all year round. I have always believed that a parkrun comes of age when the event director awards the first parkrun 50 club milestone T shirts at that parkrun. It is exciting to observe how after a little over 12 months after a parkrun was launched the first parkrunners from that community are suddenly being recognised as “veterans”. Time certainly does fly. This was certainly the case at Mofolo Soweto parkrun last Saturday when Josia Selepe joined the 50 milestone club. Very appropriately the parkrun tourists donated a new 50 flag to Mofolo parkrun. In our photograph below, Josia is joined by Eda Mikhenyi and parkrun tourist, Jaco van der Walt. Eda is a stalwart volunteer and great personality at Mofolo Soweto parkrun. Prince Albert parkrun is another parkrun that recently celebrated its first birthday. A month ago Prince Albert resident, 10 year old Matthew Olivier earned his 50 shirt. At Stutterheim parkrun event director Linda Lanz will earn her 100 club milestone shirt this Saturday. Linda first ran a parkrun at Shongweni in KZN and then, seeing the potential of parkrun for her community in Stutterheim asked a few questions, and started the very successful Stutterheim parkrun. 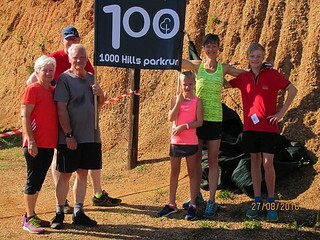 Amazingly as Linda earns her 100 shirt at Stutterheim on Saturday her daughter, Barbara-Anne Stark will be running her 50th parkrun at Shongweni on Saturday. In other news Bryanston parkrun joined the exclusive 1,000 club last Saturday when 1,014 parkrunners finished on a warm spring morning. There are about 12 parkruns worldwide that have had fields of over 1,000 finishers. Bryanston is the newest member of this “club”. For those who intend to run the inaugural Somerset West parkrun on Saturday please note that there has been a venue change. The parkrun will be run at Broadlands Farm. Please check the Somerset West parkrun website for the GPS co-ordinates. 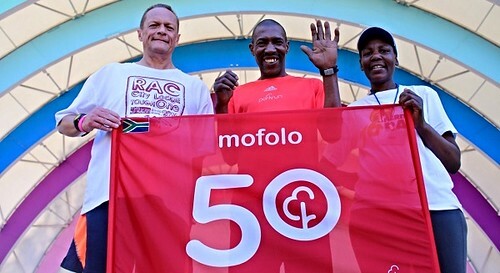 Josiah Selepe celebrates joining the 50 club at Mofolo parkrun, Soweto, alongside volunteer Eda Mikhenyi and visiting tourist Jaco van der Walt. All set for your first spring run? We are! We’re saying hello to spring with the coolest colours… you’ll find these pops of colour everywhere from our kids gear for those parkrun littlies, all the way to our light and bright Lite Knit Runners. So if you haven’t kitted out your spring runs yet, www.mrpsport.com is the starting line for your next shopping marathon for the whole family. If you’re eager to run in your hard-earned milestone tee but haven’t received yours yet, you can order it via your profile on the parkrun website. Your tee will then be delivered to your local event director within a week. Our new-look website will be up and running soon, where you’ll be able to order your achievement t-shirts directly. We’ll inform you of when this will go live – watch this space for details! Printed barcodes are used at all our events to record your result. Please click here to collect and print your barcode. No printed barcode, No result. We have teamed up with TenBits to provide a barcoded wrist-band (see the image above). 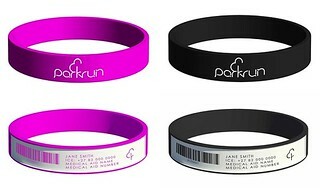 This wrist-band includes your parkrun barcode and emergency contact details. In addition, a portion of the proceeds contribute towards parkrun costs. For more info and orders please visit the TenBits website. To celebrate all levels of event participation by Vitality members, we have expanded our race event calendar to include any timed and verified race event in the disciplines of cycling, walking/running, swimming and major multisport events. This means you are now able to compete, and be rewarded for competing, in both local and international events by simply sharing proof of race completion with a race certificate or other supporting documentation. Remember parkrunners: Vitality members earn up to 300 fitness points for every parkrun completed. Your points will be awarded as long as you register, link your parkrun profile with Discovery Vitality, and scan your barcode after every completed parkrun. Your points will take up to four days to reflect on your Discovery app as well as your Vitality Points Monitor. 5 years ago when I first pondered about the merits of starting parkruns in South Africa one of the negative thoughts that kept worrying me was my belief that South Africans are not volunteers. I was convinced that parkrun would not work in South Africa because South Africans would want to be paid to help at a Saturday morning run. How wrong I was! The South African parkrun community has been simply amazing and volunteers have come forward everywhere to help. That doesn’t mean that we don’t need more volunteers. We do. If you would like to give back to your parkrun community please consider volunteering. It would be wonderful if every regular parkrunner volunteered from time to time. Please “opt in” on your results email if you would like to help or get in touch. Thank you for bringing parkrun to South Africa! I am 10 years old and have just completed my 100th parkrun (together with my mom)! You might remember me from the inaugural parkrun at Thousand Hills where I had to work hard to get to the finish line before you! I have run 8 different parkruns, all of them in KZN. When my parents first 'dragged' me to parkrun (they never force me or my brother to run), I spent a few events sitting under a tree, taking photos or playing on my iPad. But it didn't take long for the running bug to bite me. It even infected my grandparents who are regular parkrunners now and they are over 70! Before I knew it, I had a 10th run certificate signed by you, and then earned the coveted red 50 shirt. Every time I wear it, I get comments of astonishment from other runners and even total strangers. This makes me feel special. I also want to give a big thumbs-up to the parkrun directors from my home parkrun at Shongweni. Thank you Robin and Jason for your weekly unfailing, enthusiastic praise and support and brilliant photos that encouraged me to come back week after week, sometimes even being rewarded with a PB. Trail or road running: Trails are great for taking the puppy along. My 4 year old Great Dane is my “puppy”. Dogs and roads are not a good combination! How has parkrun improved your fitness: I have strengthened lung capacity and mobility. parkrun is not only fun, but so good for one’s health. My heartbeat is strong, my breathing is strong, my circulation is better. I do not get cold easily and I have a lot more physical endurance before I tire. My dog, Pearl, also underlines the fitness aspect and the joy of making friends. Dogs naturally know which other dogs are their friends. My favourite volunteer role: It is just great to take part, no matter what the job. What do you like about volunteering at parkrun: Just as exercise is good for the soul, serving others also feeds the spirit. One just has a general feeling of wellbeing when involved. Getting to know the organisers and other volunteers is great, but one also gets to know many of the people that take part. I am not fast, so I will miss out on meeting people if I don’t volunteer. Why should others volunteer? Firstly it is unselfish and others do it for you all the other weeks of the year. If one wants the joy of parkrun to keep existing, one must contribute. Then after the first time you have done your duty, you will find it was fun and you’ll want to help again. I say, “try it”. Most memorable or funniest moment: I had done quite a few runs and was getting nice and fit with my time improving slowly. I was starting to feel a bit like the days when I used to do a lot of sport, and it was good. Then there was a new guy at parkrun that passed me. I did my best to shadow him and pass him near the end (my own little motivation). The reason for this was that this man was older than myself and he walks with a walking stick, relying a lot on the help of said walking stick. He has serious problems walking and he is so fit. Needless to say I could not pass him and this is a weekly thing. I stand in awe of people that can overcome obstacles like that. Now I am even more motivated to get fitter. 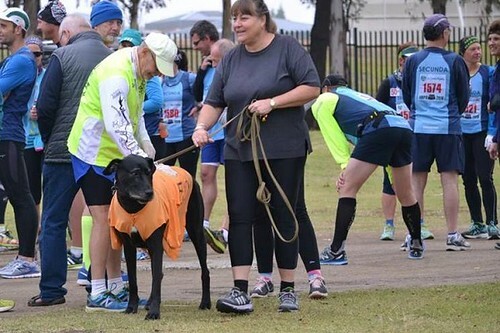 What fellow volunteers say about them: Lorraine and Pearl (the Great Dane) are always a pleasant addition to our parkrun, her talkative and friendly nature brings warmth and enjoyment to the parkrun atmosphere. This entry was posted in Uncategorized by tomfairbrother. Bookmark the permalink.